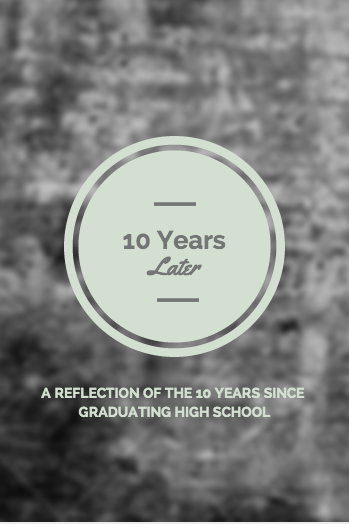 10 years ago this past May I graduated from high school (where has the time gone?). This past weekend was my 10 year High School Reunion. I thought about writing this reflection back in May when similar posts were being posted but decided to write it now right after my reunion. For the record NO I didn’t go to my High School Reunion. I graduated high school in Texas so in order to go I would have had to spend close to $1000 to get there (between airfare or gas, hotel, rental car, food, and the reunion ticket [which was almost $100 alone]). Since the people in charge aren’t very organized they didn’t even announce the details of anything until like May and I had done a TON of traveling this year I really couldn’t afford another big trip. I also thought I would be working and didn’t want to take time off work at a new job. In all honesty I really had NO DESIRE to go. Anyone I want to talk to from high school I do or am facebook friends with or wasn’t going. And really I didn’t really have that many friends in high school and many of them I lost touch with. The other thing was that because of the classes and programs I was in most of my friends were in the class above me (class of 2003) and the class below me (class of 2005) so if they ever have a reunion with like 5 years (2000-2005) I think that would be WAY more fun! But as my reunion drew near I began to think about the last 10 years. They created a facebook group for the reunion so I was able to connect with old friends that way and it was VERY INTERESTING. The same people are just as ditzy as they were 10 years ago. The same guys said the same stupid things they would have 10 years ago…and scarily some have reproduced. So it was kind of cool in this facebook group to see who has gotten married and who hasn’t. Who has had children and who hasn’t. It was also kind of weird. We’re all so old now..almost 30! What?!!? There are times I still think I’m 16 (and unfortunately get treated that way sometimes). There are so many more things I did in the last 10 years. Some smart, some stupid, some boring, and some awesome. But it’s in the past and we need to always be moving forward and not regretting the things we did in the past that we cannot change. You have accomplished a lot in ten short years. I’ll — maybe — do some reflecting after my reunion. Yeah I went to a public high school. Most of my friends in high school actually were from church more than school and b/c of where our church was located we all went to like 5 different high schools so it was interesting. There are times I feel like I haven’t really accomplished much (like I still live at home and struggle finding living wage jobs) but other times I think I’ve accomplished a lot. BethAnne recently posted…10 Years Later….